Class 201 Retrospective: Northern Irish Railways 8208 Everywhere but the Enterprise. 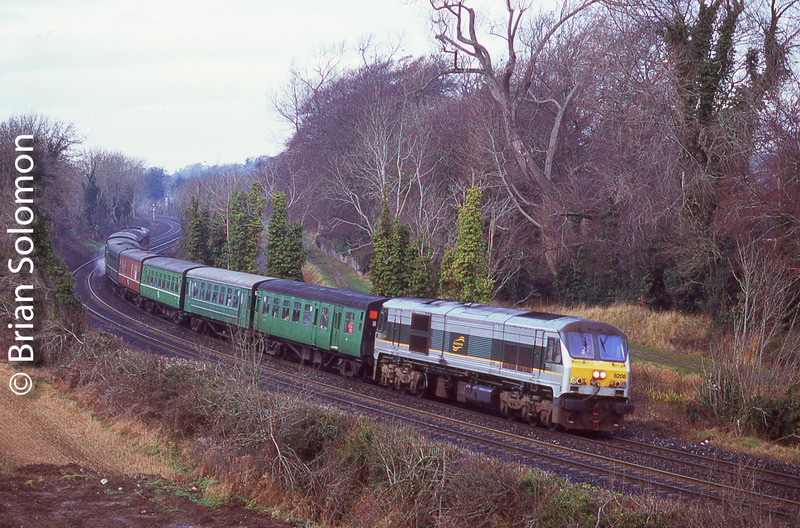 Next up for my 20 years in Ireland/class 201 numerical retrospective is old 208/8208: to be different, I’m posting views of 8208 (one of two Class 201s owned by NIR for Enterprise service) working a variety of trains but not the Enterprise! Originally, the locomotive was number 208, and it had been painted in an attractive NIR blue livery, similar to the 111-class diesels. I never saw it in blue. 208 as I first saw it; a thumbnail scan from a slide I made in 1998. 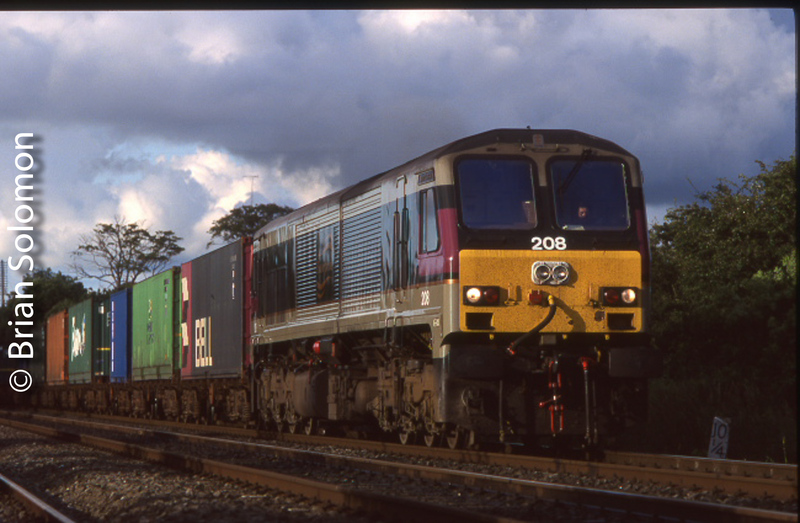 Working a Dublin-Waterford train at Athy in July 2003, shortly after it was renumbered 8208. For few years 8208 worked in a unusual variation of the Enterprise livery, as pictured here on an RPSI excursion near Clonsilla on the Sligo line in 2009. NIR 8208 in the latest Enterprise livery working Irish Rail’s IWT liner from Ballina at Memorial Road in Dublin. Freshly Painted Enterprise 8208 on Irish Rail’s IWT Liner. 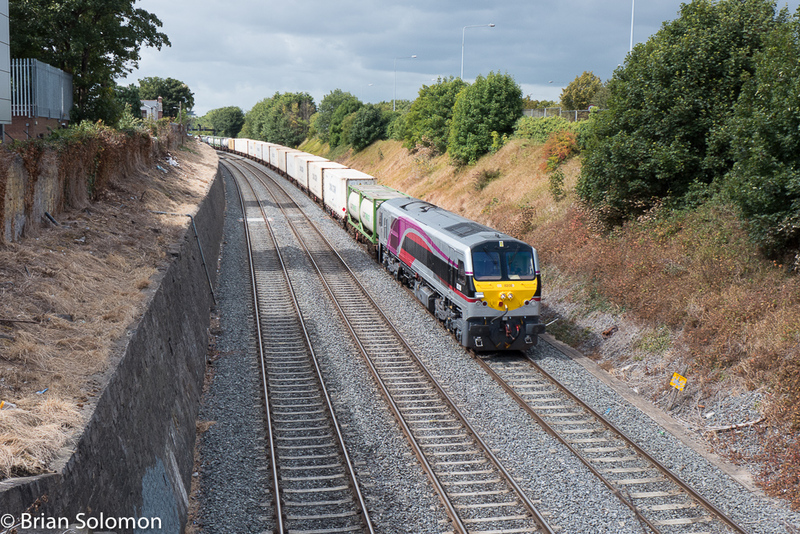 Prelude: on Friday, August 14, 2015, General Motors-built 201-class 8208 worked the Dublin to Ballina IWT liner. I’d photographed that move on the quad-track near Cherry Orchard. 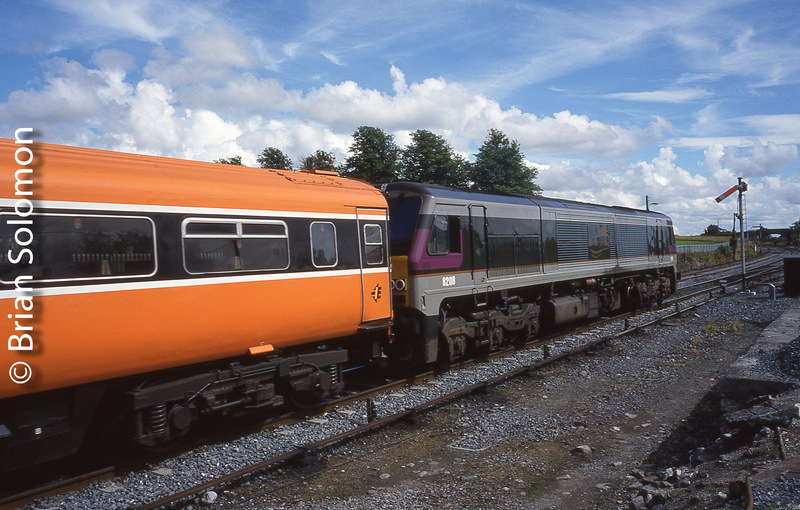 I was interested in this recently painted locomotive, which, of-course, is styled for the Dublin-Belfast express passenger service, and not freight. Day of action: On Saturday, I saw reports of 8208 working the up-IWT liner. This was an otherwise dull afternoon. I crossed the War Memorial Park on foot. No Vikings with their long boats today. I found my spot, and was poised at the Con Colbert Road bridge over the three track-line in a cutting (known colloquially as ‘the Gullet’). Moments before the liner appeared, the sun briefly emerged from the clouds. Lucky me! And so this Saturday-freight eased up to the ‘Bridge of Signals’ giving me plenty of time to expose photographs. Saturday 15 August 2015; Lumix LX7 digital photograph. Not bad for few minutes away from the computer on a weekend afternoon.